Scottish Labour needs an authentic voice as its new Leader, that's why I am supporting Richard Leonard. Unless you have been hibernating, you will have noticed that the voters have moved on from triangulation politics, where leaders follow the latest focus group and chase cheap headlines. Slick presentation and a few sound bites just doesn't hack it any more. As Jeremy Corbyn showed in the recent election, there is a real appetite for change that people can believe in. Articulated by leaders who can demonstrate their credibility through their record. 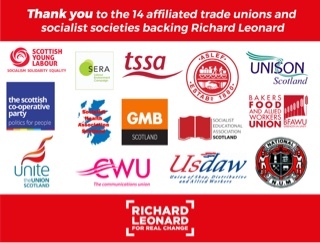 I have known Richard Leonard for many years and count him as a comrade and a friend. Throughout those years he has developed new ideas, even changed his mind, but never his underlying socialist principles. Richard often quotes from our history, not to literally apply the policies of the past, but to remind us that we stand on the shoulders of giants whose values are just as relevant today. This shines through in the policy rich platform he has developed in this campaign. On industrial policy, workers rights, poverty, public ownership and many more, these are the issues that matter, articulated by a person who has the credibility that consistency brings. Richard understands that it's inequality that is at the root of Scotland's ills and his track record shows he has campaigned on these issues all of his working life. The arguments in favour of Anas are sadly remarkably similar to those made for Jim Murphy - often by the same people. His policy announcements lack a consistent theme and are rarely original. This grasping at populism is exactly what led to Jim Murphy's alcohol at football matches debacle, which epitomised that disastrous election campaign. Unlike Jim, few people actively dislike Anas, always a plus in a politician! He has come some way in recent years from his time in the Progress faction and I have always found him open to new approaches. When he gets things wrong, it's often because of inexperience, or because he hasn't quite thought through his underlying beliefs. When Richard hasn't had the time to weigh up the pro's and con's of an argument, he call fall back on a well developed set of principles. Many years as a union negotiator teaches you a bit about strategy, persuasion and thinking on your feet. There has been a lot of media froth in this campaign. No one can choose their birth circumstances and Anas has every right to be proud of his family. As a living wage campaigner, all I expect from sympathetic company directors is that they make the case in the firm for fair work principles. If Anas did that, then that's fine by me. What did surprised me is how unprepared Anas's campaign was in responding to these very predictable attacks. All the basic rules of media management were forgotten in the partial, faltering responses. Failing to apply for living wage accreditation, when Labour was championing this cause, was really sloppy. Decisions you make in your adult life do have political consequences. I'm afraid sending your child to a private school makes it very difficult to articulate Labour's inclusive education policy and inequality in general. The SNP at least claims that this is their number one priority, so it will be a real challenge for Anas at FMQ and elsewhere. I haven't yet heard from him how it plans to address this challenge. It has been argued that Richard's support for Jeremy Corbyn will return Scottish Labour to the 'branch office' days. This is particularly rich coming from the right wing establishment that resisted every effort to democratise the party in Scotland. In contrast, Richard was part of those campaigns, always championing democracy over stage managed politics. Richard supported Jeremy, not out of factional interest, but because he understood that Labour had to change. More of the same old New Labour fudging and nudging wasn't going to work - the voters had moved on. At the very time the Tories were on the ropes after the referendum, the Labour coup plotters gave them a lifeline. Richard stood by the members choice, Anas joined the coup. Electing Richard as Leader will build on the progress we made at the general election because, like our new MPs supporting him, he knows the strengths Jeremy brings to our campaigns. But Richard is no starry eyed Corbynista, he will always stand up for the Scottish Labour Party when we decide to adopt a different approach. The lazy outsider may well view this leadership campaign as a typical left v right Labour tussle. However, it's actually more complex than that. 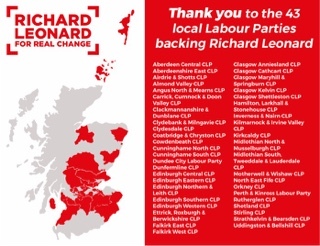 Richard has demonstrated, in the overwhelming number of nominations he has gained from both CLPs and affiliates, that he can reach out across the party - and he can do the same with the electorate. That's because people are looking for an authentic leader with a consistent track record. 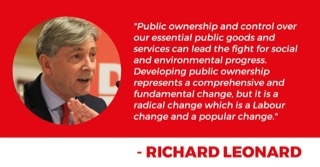 Richard embodies the principles that Scottish Labour stands for. Someone who has walked the talk and has a message of real change. That's why I will be voting for Richard Leonard. 42,400 recorded incidents of violence towards public sector workers in Scotland last year is a shocking figure – over 100 incidents every day. What's even more shocking is that this is just the tip of the iceberg with huge levels of under reporting. I was at UNISON Scotland's annual safety conference in Stirling today, presenting the findings of our annual survey on violence at work. We ask employers for the total number of assaults which have been reported in the latest year for which they have information. The aggregated returns for 2017 show 42,421 assaults - an increase of 1,255 compared with 41,166 in our 2016 survey. Local Government assaults have risen to 22,006 - an increase of 4,401 over the previous total 17,605. In Health Boards there has been an increase of 2,054 from 17,116 in 2016 to 19,170 in the 2017 survey. Our first survey of public sector employers in 2006 reported just over 20,000 violent incidents in the NHS and local government - so the total had already more than doubled in the decade to last year - and it continues to increase. This increase is partially due to greater awareness and better reporting, but we still have significant under reporting. Astonishingly, the two services that consistently fail to provide proper data is police and fire. They don't have proper systems and therefore can't easily produce data. If you are not monitoring violence, you can't be doing anything about it. A big concern articulated by safety representatives today, is the failure to record incidents. Sometimes that's because members are reluctant to report incidents involving cared for persons. In other cases managers are not recording incidents, a particular problem in schools. The absence of near miss reports is particularly telling. The numbers also show inconsistencies between similar employers that can only be explained by inadequate systems or management culture. There is a particular problem with education and social care. In education, it's more about culture. In social care it's also about lone working and the absence of work bases for staff. There is a real concern that so called 'agile working' is adding to the problem. While the statutory sector has made significant progress in recent years, the same is not true of the voluntary sector where you all too often hear the refrain, 'it's just part of the job'. We have therefore recently published an action toolkit called ‘Not Part of the Job’ to help community and voluntary sector employers who want to address this issue. There are some deep seated attitudes in the sector at a senior level, which will take some time to tackle. One of the reasons we do an annual survey is to raise awareness on this issue, but that is only part of the solution. The next stage is to put adequate reporting and monitoring systems in place. There has been good progress on systems, with a growth in on-line processes that make it easier to analyse data, although there are challenges for some groups of staff. Finally, employers should be introducing measures to minimise the risk of violence, including better training. In addition to the common law we have the Emergency Workers (S) Act that gives some additional legal protection for a limited group of workers. A Labour MP is introducing similar legislation at Westminster for England and Wales. Useful though this legislation is, typically 300 convictions a year in Scotland, it has limited scope. Most victims of violence are not covered by this legislation and the Crown Office has very limited data on how they use the common law to protect workers. The massive scale of the problem of violence against public sector workers, including those in the community and voluntary sector, has slowly begun to emerge over the last decade. It is now time for action by employers and stronger legislation, regulation and oversight by government to end the epidemic. Claudia Beamish MSP still has her members bill which would put in place a stronger legislative ban. The problem with using planning powers is that the moratorium could be overturned very easily, unlike legislation. I suspect the government has decided to go down the moratorium route to avoid compensation claims from INEOS, who now have drilling licences that they can’t use. However, as the minister said, fracking, “cannot and will not take place in Scotland” - and that is the practical effect. A national energy company is something UNISON supported in its response to the energy strategy consultation. However, we envisaged a more radical option that involves generation and transmission as well as retail. We also support a big role for municipal energy - generating electricity, managing distribution grids, running energy efficiency schemes as well as retail sales. This is very common across Europe and seriously challenges the ownership model in Scotland, something the Scottish Government has been unwilling to do. The big energy companies’ reaction to the announcement last week, indicates that some modest retail competition doesn’t worry them very much. All the usual suspects have been dragged out to tell us how wonderful the market is - all we need to do is get into switching supplier. Meanwhile, in the real-world consumers are increasingly supporting real public ownership options as set out the Labour manifesto. The TUC joined that call at its recent Congress, unanimously backing a motion that supports returning the energy sector to public ownership and democratic control. The motion also called for a mass programme of energy conservation and efficiency, a just transition strategy and investigating the long-term risks to pension funds from investment in fossil fuels. 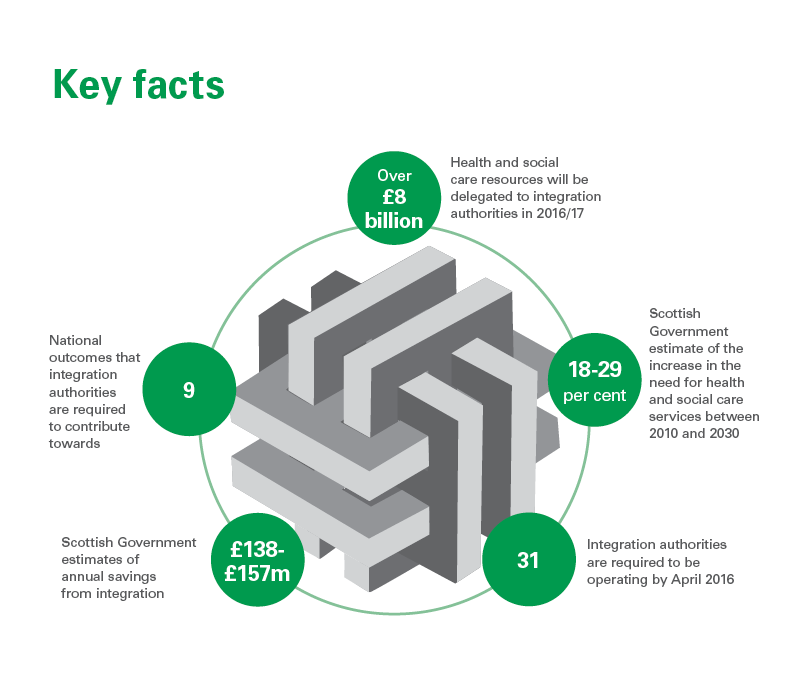 Scotland's public services are administered by some 200 public bodies. Most of these are run by boards that make the key decisions on the majority of public spending in our country. This means we should pay close attention to the governance of public boards. 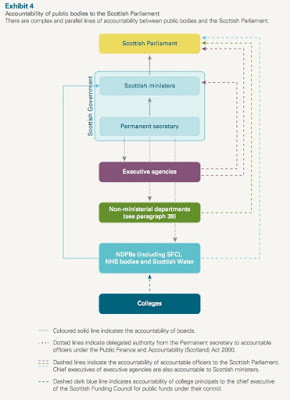 In 2010 Audit Scotland published a report on the role of boards that made a number of recommendations. Holyrood's Public Audit Committee has recently conducted an inquiry into the same issue and have published their findings in a letter to the Cabinet Secretary. Boards also take differing approaches to transparency such as holding meetings in public or private. The committee's view is that boards should be as transparent as possible and should meet in public unless there are justifiable reasons for meeting in private. I contributed to an informal evidence session during the inquiry and the recommendations are very welcome. The membership of boards has become very 'samey', with the usual suspects dominating appointments. I have heard more than one board Chair use the phrase 'a safe pair of hands'. This isn't likely to to provide the sort of challenge the Committee is referring to. Workforce representation can provide a real challenge. 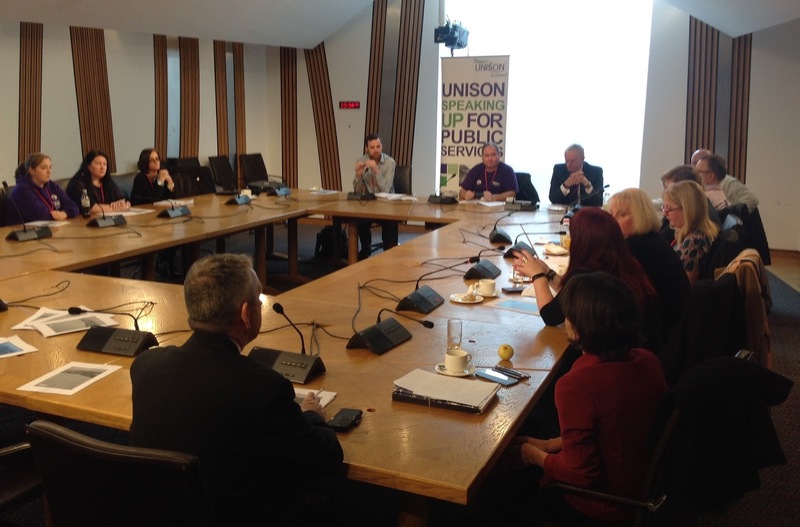 The Fair Work Convention report recommended there should be a worker representative on every Scottish public body. Some have non-executive directors with a workforce interest. While these appointments offer an expertise that might otherwise be ignored, they are not a substitute for an employee director. However, such directors need to be supported and accountable, otherwise they can become isolated and less effective. There is a tendency to use the shambles that is the SPA to highlight all that is wrong with public boards. The treatment of Moi Ali was both shocking and a 'good' example of the issues highlighted by the committee. However, we should remember that the structure of governance between Police Scotland and the SPA underpins many of the problems. There was a clear failure to recognise the governance problems this would cause when the legislation was going through parliament. While the SPA is the most well known example, it isn't the only one. I can think of a number of NDPB boards that provide very weak governance. FE colleges are one as the severance packages row has illustrated. Food Standards Scotland is another, with the food industry having too great an influence. Most boards could do better on transparency. In fairness it has to be said many of these governance failures are not unique to public boards. There has been a failure of governance in private and voluntary sector boards on pay and workforce issues. In addition, you can only appoint from applicants and many people of working age simply do not have the time to participate. On my way to giving evidence to the committee I bumped into an ex-steward who is now a senior manager in a private company that makes a big play of corporate governance. He told me that serving on public and voluntary sector boards used to be encouraged - now it is barely tolerated. The Audit Committee recognises that some progress has been made in recent years, particularly over gender balance. Government now needs to focus on strengthening other aspects of governance. This report is a good starting point.